Bonnie and Derek recently visited us in school for our assembly. Bonnie guided Derek into the main hall, she was very conscientious about her job and was on ‘Duty.’ We watched film clips on puppy training ‘Guide Dogs’ and how intensive and costly it is to train a puppy ready to work as a guide dog. The puppies are born at headquarters in Leamington Spa, Warwickshire and undergo 2 years of training at a cost of £60,000 per puppy. We learned that there is a waiting list for people needing ‘Guide Dogs’ and that a dog has to be matched to an owner. Owners and dogs come in all shapes and sizes! 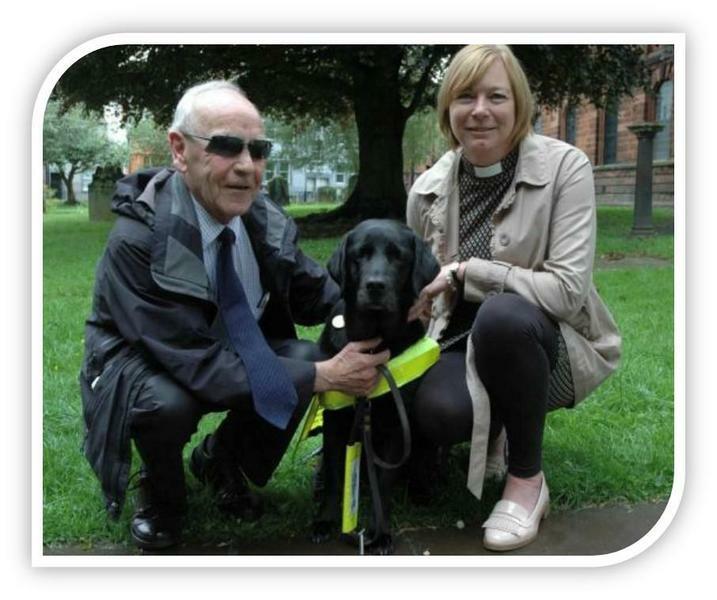 Derek talked about being matched to Bonnie after his previous Guide dog had to be retired. A trainer from Leamington Spa stayed with Derek and Bonnie for two weeks to ensure that Derek was sufficiently confident to take on board all of Bonnie’s fantastic skills and he helped to facilitate the bonding and trust between human and guide dog. Derek has total faith and trust in Bonnie to keep him safe. She has made him confident enough to participate in many adventures. Bonnie didn’t take her eyes off Derek-She is his eyes! She guides and keeps him safe. Bonnie does love fuss and is only able to play and enjoy a pat and stroke when she has stopped working. Once Derek removed Bonnie’s harness she rolled over on the floor and wanted the us to tickle her tummy. Once that harness was put back on Bonnie - she became Derek’s eyes. She was working! We enjoyed Derek’s visit and to thank him we made Bonnie and Reverend Mandy’s Labrador- some salt and sugar free biscuits. Reverend Mandy accompanied Bonnie and Derek. They attended Reverend Mandy’s ordination ceremony at Carlisle Cathedral! Her black Labrador likes to play with Bonnie! Thank you Derek and Bonnie and Rev Mandy for bringing them to North Lakes! Remember if a guide dog is wearing a harness it is working- Please do not distract the dog by patting it.